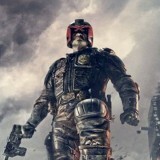 Story Line: Rookie Jude Cassandra Anderson spends her first day of evaluation with the legendary Judge Dredd. A routine homicide investigation turns into a fight for survival in a locked down tower block ran by the murderous drug overlord Ma-Ma. 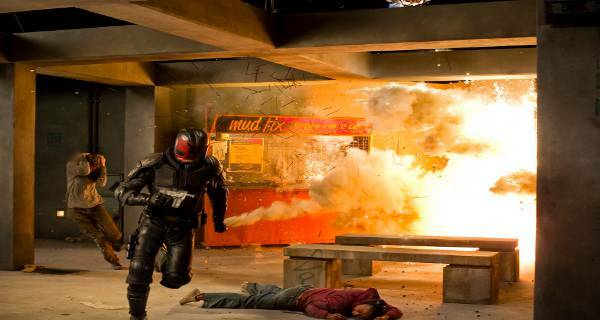 Overall Dredd 3D is a raw and solid action film that doesn’t ask you to completely dis-engage your brain because it’s so relentlessly dumb and stupid that it’s the only way you’ll actually be able to enjoy it. It serves up a raw, gritty and highly violent 95 minutes of Dredd’s universe that is peppered with some occasionally humorous moments and a fantastic performance by Karl Urban. There is a hope from me that this film succeeds mostly so that I can see Karl tackle Dredd once more, hopefully in a more expanded setting with a greater glimpse into the world of Mega-City One. There in the first five or so minutes of the film starting, a sense of dread (ho ho) swept over me that this film simply wasn’t going to be any good. We’d all been privy to the issues that had beset the film in post-production, that the director had been kicked off editing duties and taking his place was first time novice (and the film’s screenwriter) Alex Garland. So I went into the cinema and expected the worst which seemed like the safest thing to do. The great thing about Dredd 3D, as a film, is that with the passing of each scene you love it a little bit more so that by the time you walk out of the cinema you’re seriously considering whether you could grab another showing. The film’s rather diluted opening scenes soon give way to explosive action sequences that are coherently shot, a characterisation of Dredd that feels honest and faithful to the comic book roots, some memorable dialogue and visceral gore. 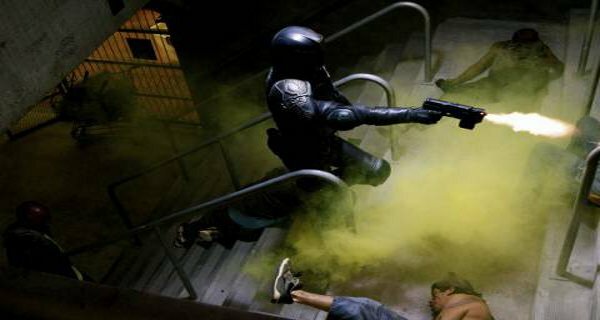 In these days of overly bombastic camerawork and spasmodic editing, the way Dredd is filmed and cut feels very refreshing and against the grain of most typical modern action films. More Die Hard than Bourne. 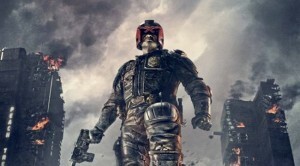 The Slo-Mo sequences are exquisite depictions of both violence and gore in equal measures and are never over-done, which was another one of my fears given the plot revolves around Dredd and his new partner Anderson battling their way through a bustling monolithic housing tower block, which happens to be the distribution centre for a drug that slows down the brains perception of time. The 3D is very much a mixed bag – used to stunning effect during the slo-mo sequences and in a few other occasions, but otherwise it’s somewhat flat and ineffective during the other parts of the film. The plot itself is very simplistic but it works for the film rather than against it, by keeping things simple Alex Garland has been able to introduce the Judges and their world more casually to newcomers to the Dredd universe. You can tell it’s been done by design however, the film’s modest budget is used well during the action sequences but between them the sets are repetitive and cheap looking, which is of course easily explained by the surroundings that the judges find themselves in. This on screen depiction of Dredd and his universe has been massively toned down from the comic books in terms of the satire that the Judge Dredd comics are famous for… presumably as a direct counter to the Stallone film of 1995. That said Karl Urban takes a fantastic starring role, his dry and drole delivery of Dredd’s singular truth of justice is engaging and entertaining to watch. It takes a very good actor to make such a two-dimensional character so utterly enthralling and he excels in this role. Likewise Olivia Thirlby does a great job in the role of Judge Anderson, Dredd’s new rookie partner who lacks his black and white view on justice. There is definite growth in her character throughout the film as her own view on justice and the law is forever changed and altered by her time with Dredd. Lena Headey serves as the chief villain, Ma Ma, a former prostitute turned drug lord. She provides a suitable foil for Dredd and Anderson’s line of justice but as a character she feels slightly under-used if suitably comic book like in her twisted and evil actions. The score by Paul Leonard-Morgan suffers from something I like to call Dr Who syndrome, in that it’s constantly over-used throughout the film even when entirely unnecessary and doesn’t always fit in well with what’s happening on screen. However in places it offers a great accompaniment to the on-screen action, particularly during the slo-mo sequences.